The following excerpts are from the pages of the publication NOW, totaling 32 pages. Although a publication date is not known, based on content, a period before the declaration of war with Nazi Germany and after the winter period -- from March to August 1939 -- is most likely. The location for the publication is Toronto -- identified on the last page as the Wilson Building. Much of the content focuses on communities in Ontario, which also had strong fascist and antifascist support. The newspaper itself comes from the collections of the Windsor Community Museum. Identified as Vol 1., No. 1, it is unclear how many additional issues, if any, were published. 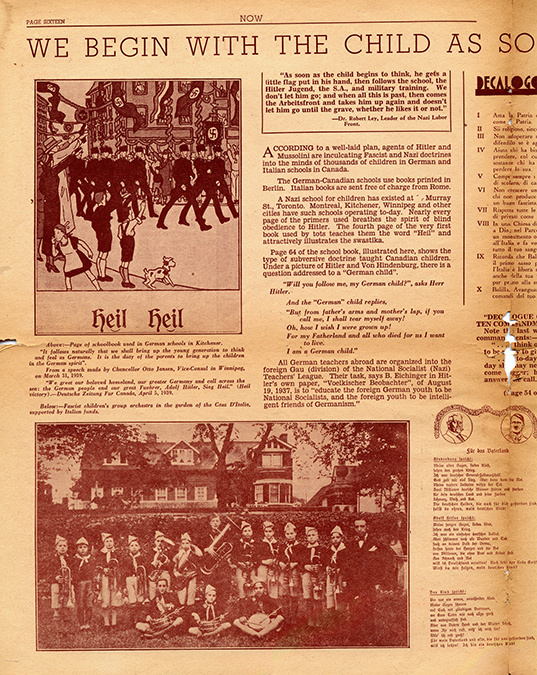 The articles detail the "alarming" activities of fascist groups and individuals in Canada, who are seen as "puppets" of the Nazi German Government and the Italian Government. An article entitled "The Black Hand of Mussolini" begins with: "Few Canadians suspect that the Italian Foreign Office directs the lives and activities of scores of thousands of Italian-Canadians". The article names and quotes Massimo Magi, and under the sub-title "Treason Sponsored" names Luigi Pascale "employed by the immigration department", Luigi Mecone "Windsor Fascist Leader, employed by the post office", and Joseph Falsetto "Windsor Fascist Leader, employed by the Liquor Control Board". Also named as associated with the fascio are: Ruggero Bacci, N. Zaza (financial secretary), and G. Ciacco (administration secretary). The same article contains an image of a clipping from the newspaper L'ITALIA. Highlighted are the names of those who donated to the building of the Casa d'Italia in Montreal, including: A.D. Sebastiani, Silvio W. Narizzano, A.S. Biffi, Guido Casini, and Vincenzo Poggi. Another five names appear, but these men seem to not have been interned. A note at the bottom of the lists reads (translated from original Italian): Guido Nincheri has offered his services, free of charge, to decorate the building. Casini has also offered to sculpt busts of the King and Mussolini for the Casa d'Italia.